The Perfect, Unique Bridal Shower Gift Idea! Are you looking for an amazing gift idea for a bridal shower, wedding, bachelorette party or engagement party? Show off your skills as an amazing gift-giver, and treat the special couple to a thoughtful way to stop and enjoy life's moments and milestones. Give the soon-to-be newlyweds the gift of celebrating some of the milestone moments that happen in the first year of marriage. Tell the happy couple to toast the firsts, and enjoy life's moments together. 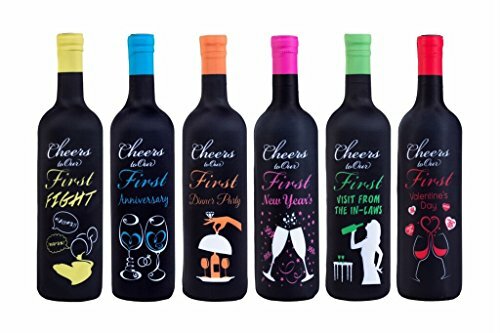 Tipsy Toasts, First Year of Marriage Milestones Wine Bottle Covers is a sentimental and unique gift perfect for bridal showers, engagement parties & weddings. An extraordinary 'off the registry' gift for the bride and groom which celebrates the milestones of the first year of marriage. Gift Tipsy Toasts Wine Bottle Covers to the bride and groom to cover their favorite bottles of wine. Or create a fun gift basket filled with Firsts for the bride and groom, which can be enjoyed long after the wedding day is over. Show off your skills as an amazing gift-giver, and treat the special couple to a thoughtful way to stop and enjoy life's moments and milestones. Tipsy Toasts wine bottle covers fit standard size 750 ml wine bottles. 6 wine bottle covers included. Does not include wine bottles or glasses. Celebrate the First Year of Marriage Milestones With Tipsy Toasts Wine Bottle Covers! A Sentimental Gift Idea for the Bride & Groom to Cover Their Favorite Bottles of Wine. Or Create an Amazing Gift Basket Filled With Firsts Which Can Be Enjoyed Long After The Wedding Day Is Over. 6 Wine Bottle Covers Included. Wine Bottle Covers Stretch Easily Over Wine Bottles. Fits 750 ml Bottles. If you have any questions about this product by Toast The Firsts, contact us by completing and submitting the form below. If you are looking for a specif part number, please include it with your message.